Coach Mike Krzyzewski addressed the media today and, as usual, his summer session provided a lot of information. The biggest news to some was that it is now official that Andre Dawkins will redshirt this coming season. But there was so much more. In fact, there was so much information that I decided to just share several interesting notes from today, so read on and enjoy. -Andre Dawkins will redshirt this coming season. Details were not given, out of respect for Andre's personal privacy. 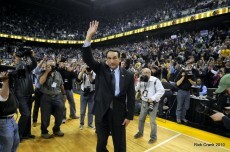 - Coach K said that last season's team was not good defensively out front. The perimeter players were not big enough or long enough to effectively pressure the ball. However, he expects they will be better able to apply that pressure this season with improved size and length on the perimeter. Improving the team's on-ball pressure will be addressed in the off-season, as will reinforcing defensive concepts out front. - Coach K said this year's team would be more versatile and would benefit from having three senior leaders in Mason, Ryan and Seth. - Ryan Kelly has fully recovered from his injury and is currently working out in Las Vegas. - In fact, all the Duke players are currently in good health. - Mason Plumlee is on an internship and is working out in Chicago. -- Alex Murphy left two days ago for Finland to play on the Finnish National Team. His Mom played for Finland's national team as well. Coach said that Murphy would get a lot of playing time. Duke will use the 6'8" Murphy on the perimeter or in the SF role. K said having him on the wing would stretch the court and allow Duke to do some different things. - Seth Curry will play off the ball more in order to hunt his shot. Thornton, Cook and Sulaimon would be the primary ballhandlers if the season were to start today. - K did not mention anything about Josh Hairston losing weight in the off-season, but did say that Josh could play more on the perimeter than he has in the past. - Marshall Plumlee is up to 240 pounds, and K believes last year's redshirt season would help him. He likes his work ethic and enthusiasm, and mentioned his toughness as well. - Incoming freshman Rasheed Sulaimon has played well and K believes that he, like all players do, will grow from the experience of playing international basketball. - One peeve that Coach K mentioned was the transfer rate in college basketball. He thinks it's just out of control, as more than 450 kids are moving to different schools. As the NCAA is not doing much about the problem, K believes that college hoops needs a governing body to address issues like this. - Coach said the one-and-done mentality has always existed but that players now leave more quickly when facing controversy or any type of difficult situation. He noted as well that sometimes kids leave before the book is written, and referenced 2010, where Duke's senior-laden team blossomed into champions. - Also on transfers, K believes that transfers are being recruited harder than high school prospects now, and he implied the battles were vicious. Again, he recommends that studies needed to be done to support controlling this trend. - He mentioned some teams trying to improve their APR as well, as that measure will have UConn on the sidelines of the NCAA tournament this year. - Coach was aked if in the future he would recruit differently in light of having lost Kyrie Irving and Austin Rivers back to back, after only one year apiece at Duke. He said there are no real recruiting philosophies that he could describe in the current climate. - He also said that Rivers and Miles Plumlee were expected to do well in the upcoming NBA Draft, and that the success of former Duke players in the league enhances perceptions of Duke and helps Duke's image with new prospects. - Coach said that he faces challenges with Team USA from both the effects of the condensed NBA season as well as injuries. They have yet to finalize a roster. He glowed when talking about the play of Russell Westbrook, and scoffed at so many analysts who examine his game under the microscope, noting that Westbrook is just 24 years old. He said LeBron James would play for Team USA for sure. In discussing LeBron, Coach K stated that some kids learn in different ways and that while James has had to learn some tough lessons, he is a special and gifted player. - When questioned whether it bothered him that N.C. State and North Carolina seemed to be getting more love, he quipped, "I like what we've done" and preferred to talk about that. He gave a bit of a sly smile at that moment, and there is good reason for that. My take is that K was saying, in effect, "let people overlook us. That's exactly what we want them to do." And if you truly know hoops, then you realize Duke will be just fine this coming season and when it's all said and done, the Blue Devils will sit in their customary position at the top of the league. For more of my take on the event and to discuss the latest of other BDN Premium members, join today!